Size of this PNG preview of this SVG file: 506 × 599 pixels. Other resolutions: 203 × 240 pixels | 405 × 480 pixels | 507 × 600 pixels | 648 × 768 pixels | 865 × 1,024 pixels | 1,075 × 1,273 pixels. Deutsch: Alliierte Besatzungszonen in Deutschland. Gebietsstand vom 8. Juni 1947 bis 22. April 1949. 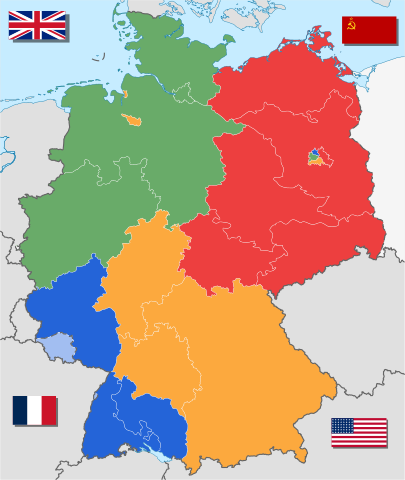 English: Allied Occupation Zones in post-war Germany as of June 8th 1947 til April 22nd 1949. Nederlands: Geallieerde bezettingszones in Duitsland, periode van 8 June 1947 tot 22 April 1949. العربية: احتلال الرايخ الألماني من قبل قوات التحالف، وتم تقسيمها إلى 4 مناطق يوم 8 يونيو 1947. 2007-07-18T18:09:28Z R-41 900x600 (1858 Bytes) Made the red a deeper red, like red on cloth flags rather than the overly bright RGB screen versions..
2006-05-01T19:44:41Z Kyle the hacker 900x600 (686 Bytes) CORRECTION OF THE COLORS ! 2007-05-09T05:00:10Z Zscout370 600x300 (2880 Bytes) Fixed the flag according to the talk page and according to the Soviet laws I have on me. 2005-12-16T00:58:02Z Zscout370 600x300 (3597 Bytes) I group stuff together, but for some reason, it cut down on the file size. 2008-10-24T02:03:47Z Tkgd2007 380x200 (10774 Bytes) Correct the vertical spacing of stars. 17:25, 2 January 2018 1,075 × 1,273 (764 KB) Illegitimate Barrister fixed French flag's colors.